The Board of Directors of the American Hellenic Council (AHC) has announced its decision to honor Congressman Gus Bilirakis, US Representative for the Twelfth District of Florida with the 2013 Pericles Award in Politics. 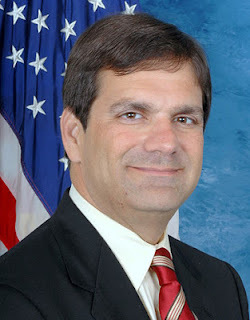 Congressman Gus M. Bilirakis is a Republican from Palm Harbor, representing Florida's 12th Congressional District. He was first elected to Congress in 2006, and is currently serving his fourth term in the United States House of Representatives. As a young boy, Gus learned the importance of public service from his father, Michael Bilirakis, who represented Florida's Ninth Congressional District from 1983 to 2006. The elder Bilirakis also instilled in his son a pride in the family's Greek heritage, which Gus proudly carriers into his career today. “We decided to honor Congressman Bilirakis in recognition of his dedicated work in Congress supporting the Hellenic Causes. He has been a leader in advocating for religious freedom and human rights protections in Turkey, for an end to the illegal occupation of Cyprus and for cooperation among the closest US allies in the Eastern Mediterranean; Israel, Cyprus & Greece.” stated Alexander Mizan, Executive Director of the American Hellenic Council. Gus serves on the Energy and Commerce Committee, the longest-standing committee in the U.S. House of Representatives and is Vice-Chairman of the Veterans' Affairs Committee. He is a member of the Republican Party's Whip Team, Chair of the Veterans' Affairs Task Force for the Republican Policy Committee, Co-Chairman of the Military Veterans Caucus and Co-Chairman of the Congressional Hellenic-Israel Alliance. He and his wife, Eva, have four sons – Michael, Teddy, Manuel and Nicholas. The award ceremony will take place at the Omni Hotel in Downtown Los Angeles on Saturday, March 30, 2013 and is part of the AHC's Annual Awards Gala. The other honorees at the event will be Ambassador of the Hellenic Republic Gianna Angelopoulos-Daskalaki receiving the Aristeio Award and Professor, Thanasis Maskaleris receiving the Saloutos Award. Michael Dukakis, Former Governor of Massachusetts and US Presidential Candidate will be Master of Ceremonies. Αναρτήθηκε από KAROUSOS ART CRITICS στις 9:05 π.μ.